Andy and I lived and worked in Siem Reap, Cambodia for 14 months from October 2016, so I felt I really should post about the most famous attraction here, the Angkor Archaeological Park. I hadn’t previously written about the Angkor Archaeological Park because although we’ve visited nearly all the temples, it was during our first time here together. Being around eight years before that meant our memories were somewhat hazy, and also things had changed. Siem Reap’s tourism has boomed over subsequent years, resulting in more visitors to the temples, and prices have also recently increased. 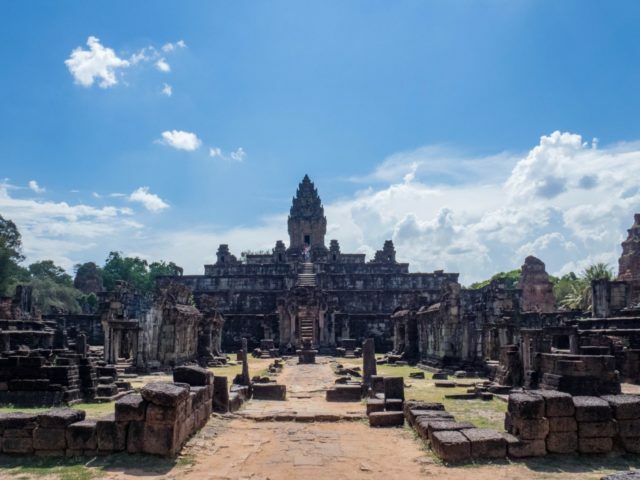 Ketki from Ekocats has written about if Angkor Wat is worth visiting which will give you a view from someone who has visited recently. So, because of all that, I didn’t personally feel qualified to write a well-informed, accurate post on the subject. 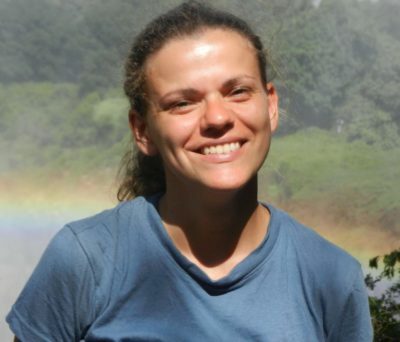 Therefore Carola Bieniek from Notes on Traveling has kindly written about several of the outlying temples for me. 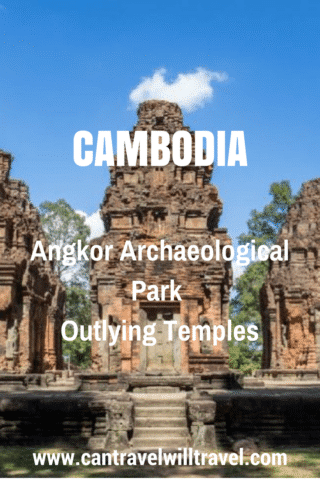 These are a little further out from the main complex where the most popular temples of Angkor Wat, Bayon, Ta Phrom, and Angkor Thom are found. Banteay Srei (also Banteay Srey or Banteay Srei) is a 10th-century temple dedicated to the Hindu goddess Shiva, located about 35 km northeast of downtown Siem Reap. 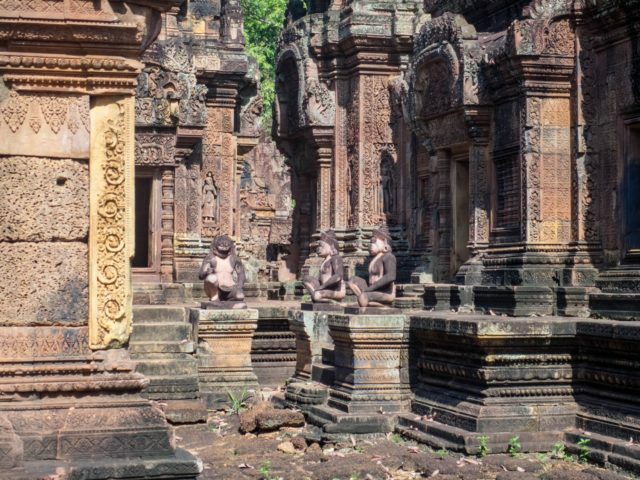 It is the only major Angkor temple not built by a king but rather by two royal advisors. It was one of my favourites among the Angkor sites. The detail in combination with the reddish colour of the stone makes this temple unique. On the downside, the temple is on the must-see list for all large tourist groups, and later in the day, it might be hard to find a spot not covered by selfie takers. While the complex itself is not as massive as some of the others, the red sandstone looks impressive when approaching along the long access path from the East. Once you get closer, you will want to spend half an hour to an hour exploring the intricate carvings and detailed sculptures. 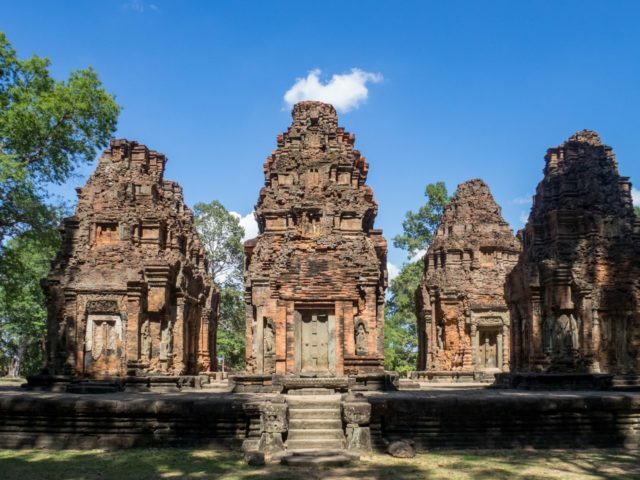 In fact, the modern name “Banteay Srei,” which translates to “Citadel of the Women” or “Citadel of the Beauty,” is probably a reference to the beauty of the bas-reliefs. If you have a little more time, check out the agricultural park surrounding the temple. 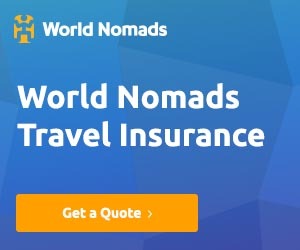 You can take a boat ride across the lake, follow a handful of short, easy-to-walking paths through fields and forest, and learn about rice farming techniques. You’ll need motorised transport for your visit. Since the temple is not very big (even if you include the park in your tour), it’s a good one to combine either with a visit to Kbal Spean temple or maybe the waterfalls in Kulen National Park. I booked a tuk-tuk for a combination of Banteay Srei and the Big Circuit via my hotel. 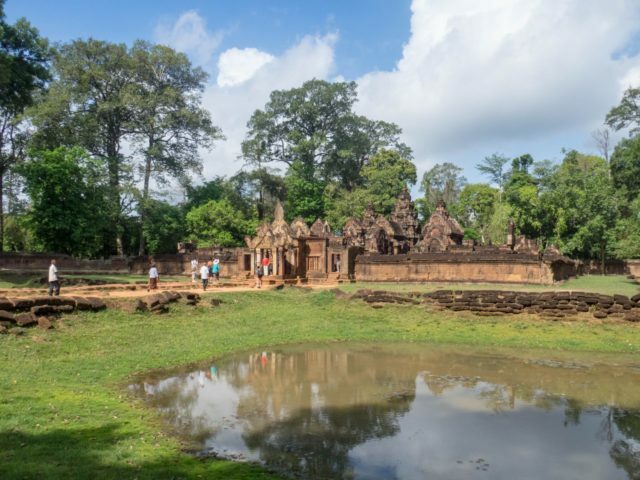 Group tours to Banteay Srei usually also include some of the Big Circuit temples and come with the added benefit of a certified guide. The temple is open from 7:30 am to 5:30 pm, and is included in the Angkor Temple Pass. I visited in the late morning, before the sun stood too high and before the tourist buses arrived. I could have easily come earlier as I’d imagine the red stone looks great with the morning light coming from the East. There is a large, relatively new visitor centre/ market area at the entrance of Banteay Srei as well as a couple of restaurants selling the usual Cambodian fair for tourists. Roluos Group is about 15 km Southeast of Siem Reap along the highway to Phnom Phen. Historians suggest that the area used to be the location of a pre-Angkor Khmer capital. The ensemble visible today comprises four 9th-century Hindu Temples: Lolei, tiny Prasat Prei Monti, Preah Ko, and the highlight, Bakong. Lolei today part of a working Buddhist monastery. The only 9th-century remains are four brick towers on a terrace. Reconstruction of the structures is currently underway. I spend less than half an hour at Lolei. Preah Ko is reminiscent of a miniature version of Pre Rup. The current name translates to “Sacred Bull” and refers to the sandstone sculptures of bulls guarding the central brick temple towers. My visit to Preah Ko took less than half an hour. Bakong, by far the largest of the four Roluos temples, is surrounded by a moat of Angkor proportions (though the island itself and site are much smaller). It’s accessed by a path either from the East or the West, the North and South access routes have been lost. The central terraced mount allows for lovely views of the area, and the elephant sculptures along the corners of the terrace are great examples of the sandstone sculptures found throughout Angkor. I spent an hour here, including taking a walk half-way around the wall along the outside of the moat, where I watched monkeys and villagers going about their daily lives. The Roluos group is far less touristy than the other Angkor sites and is, therefore, lacking the tourist infrastructure. However, some vendors are selling fresh fruit and cold drinks outside Lolei and Bakong. Lolei also has a few local food vendors catering to the temple visitors more than tourists. If you don’t mind the heat and moving along the main road, Roluos Group is a good site to visit by bike. The temples are spread out over about 2 km with Lolei North of HW6 and the other temples to the South. Alternatively, you could visit Roluos by tuk-tuk or rental scooter and see it on the way to or from Beng Mealea. The temples are officially open between 7:30 am and 5:30 pm, and are included in the Angkor Temple Pass ticket. However, there were no visible gates or means to close any of the temples off from access outside those times. While I visited in the early afternoon, Preah Ko is probably better visited in the morning, when the light comes from the East. Since it’s elevated, Bakong could be a good spot for both sunrise and sunset. 12th-century Beng Mealea (aka Boeng Mealea or Bung Mealea) is a Hindu temple dedicated to God Vishnu with some Buddhist depictions, located about 60 km by car east of Siem Reap. Even though it’s a bit outside Siem Reap, Beng Mealea is worth a half-day visit when you’ve already done most of the Angkor Archaeological Park because it gives a good idea of what the Angkor temples might have looked like when they were rediscovered in the jungle a mere 100 years ago. The temple is vast with numerous courtyards surrounded by cloisters, but at the same time, only a few restorations efforts have been undertaken. So you see a lot of piles of stone and explore the site from a raised walkway, and you can still find a few giant trees and vines covering the ground (or roofs). 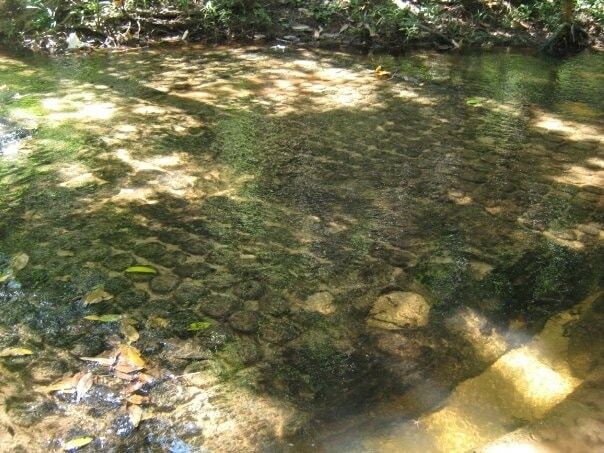 Make sure you go to the North to see the spot where according to legend the king’s daughter, whom the temple was built for, died in the riverbed when her horse got spooked. Beng Mealea is best visited either by car or rented scooter as tuk-tuks would easily take two hours one way from Siem Reap. You can also book a shared tour for about $30 (plus entrance fee). Beng Mealea temple is open between 7:00 am and 5:30 pm and costs $5 to enter (it is not included in the Angkor Temple Pass). Right outside the temple complex, there is one main restaurant most of the tourists go to as well as a couple of more local joints charging similar prices for their mains. Also, there are plenty of vendors offering cold drinks and trinkets. 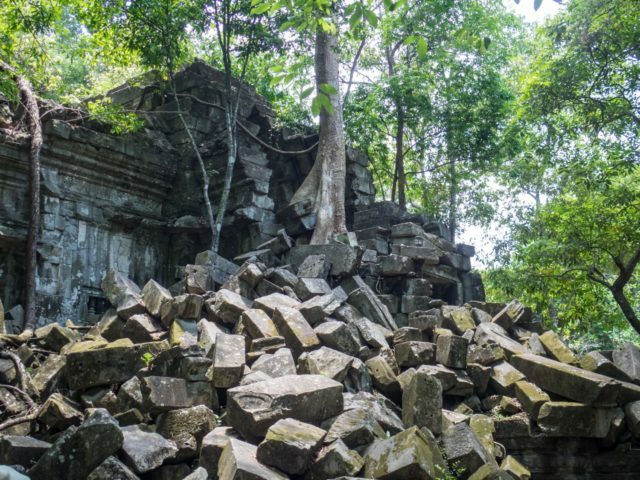 Beng Mealea is one of the highlights for larger groups as well as Cambodians on a day out. So the walkways and the best photography spots can get busy. Avoid the crowds by arriving early. Being covered in a fair bit of vegetation, there is no best visiting time for Beng Mealea regarding light. One temple Carola didn’t get to explore properly was Kbal Spean. From memory, I recall this as being our favourite outlying temple so I felt I had to include mention of it here. It is situated about 50 km Northeast of Siem Reap on the Southwest side of Phnom Kulen National Park, where Mount Kulen can also be found. Included in the price of the ‘Angkor Temple Pass’, Kbal Spean is set deep in the jungle on the ‘River of a Thousand Lingas’ and is made up of many intricate sandstone carvings on the riverbanks and in the riverbed. There are also waterfalls to cool off in. To reach and explore the site a tuk tuk, moto, or private van/ taxi from Siem Reap is required plus a hike into the jungle when you get there. Our memory is a little vague from our visit, but luckily Aditi Shukla of Lyf&Spice travel blog wrote a great informative post last year about Hiking to “Kbal Spean” – the lesser known trail of Siem Reap!, which goes into lots of detail. One thing to bear in mind with Kbal Spean is if you want to see the full effect of the water running over the stone carvings it’s better to visit just after the rainy season (November – January). If you have more than a day or two in Siem Reap it’s definitely worth getting a multi-day pass to visit some or all of these outlying temples. 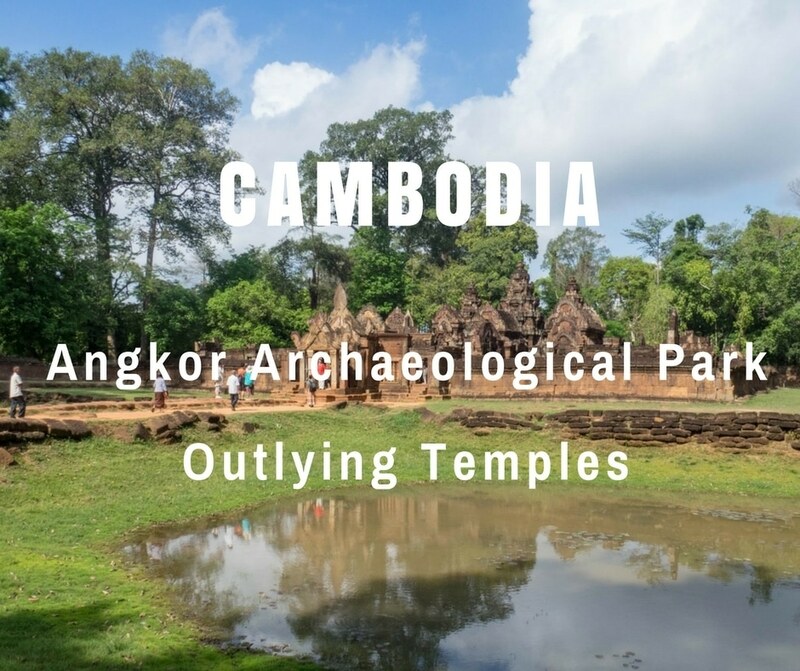 If you’re looking for a first-hand review of the more frequented temples read about the best temples of Angkor Wat by Amy from Temple Seeker. Lyf&Spice also has a post on the Small Circuit, and another in the pipeline on the Grand Circuit. The great photos of Angkor Wat by Red Fedora Diary are also sure to make you want to visit. Have you visited any of the outlying temples of the Angkor Archaeological Park? What’s your favourite temple and why? Ahh this is great! Whenever I finally get to visit Angkor (hopefully next year!) I plan to spend quite a bit of time there exploring it thoroughly so this will definitely come in handy. The coolest thing about this place was seeing how nature was able to grow through it. For days we heard about how cool the trees were here, but I kept thinking its a tree who cares. Well its definitely worth the trip. There are multiple different areas where nature and man made buildings became one. I literally let myself get lost in here to experience it all. We didn’t really need the guide to explain anything for this portion of the trip. its doable on your own. I would recommend this! Absolutely, I completely agree. Great to just wander and explore by yourself! Kbal Spean my all time favourite! Thanks for contributing!